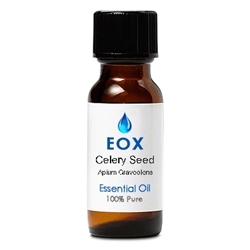 Celery Seed Oil has multiple applications in aromatherapy. It may be used topically or as a vapor. The aroma itself is pleasing and calming to the mind releasing emotion tied to hurt and loss of trust. Celery seed can provide relief for arthritis, and used as a treatment for digestive and liver ailments, as well as high blood pressure. It is an anti-inflammatory, antibacterial, calming, and a diuretic. Celery seed oil also may provide relief for menstrual discomfort. 2000 years of history: The Roman researcher and medical doctor, Aulus Cornelius Celsus, created the only surviving Roman medical text, "De Medicina," in which he recommended the use of Celery Seed. A pale yellow to orange yellow liquid with a sweet, long lasting, spicy-warm scent that has a fatty odor definitely reminiscent of the familiar scent of celery. It blends well with Carrot Seed, Thyme, Palmarosa, Basil, Roman Chamomile, Fennel Seed, Cinnamon Bark, Clove Bud and other herbal scents. These are naturally occurring in the essential oil. Externally the oil is relatively non-toxic; it can cause acute local irritation and possible sensitization in some. Use in dilution only with care, in moderation. Avoid if breastfeeding. Do not use if you have high blood pressure or thyroid problems. Avoid if you are taking sedatives, blood thinners, diuretics. Important Note: The information on EssentialOilExchange.com is only provided for educational purposes, and further research should be done on each essential oil to be assured of its proper usage for each individual. Aromatherapy is not meant to be a replacement for care under a qualified health professional, but should be considered a complimentary modality. © 2005-2016. All Rights Reserved. Powered by Essential Oils.